Capcom has revealed details about the 2017 Capcom Pro Tour structure, confirming Battle Arena Melbourne 9 as a Global Premier Event! UPDATE: The international champions are coming! Already confirmed are Daigo, Inflitration and Xian. Unlike last year, winners of Premier events are not guaranteed entry into the year-ending Capcom Cup, but are awarded a large amount of points towards their place on the CPT Global Leaderboards – 400 points, in fact: as many as getting to the Top 4 at Evolution! 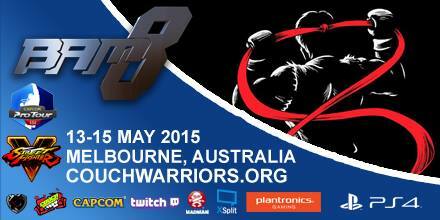 BAM is the one of the largest annual fighting game tournaments in the southern hemisphere, and BAM9 will be our biggest year yet. Be sure to book your ticket now!